Airtime transfer is another option of transfer that involvesvtopping up a prepaid account from another. There are four major networks in Nigeria today namely MTN, Glo, Airtel, Etisalat,and they all have their own methods of airtime transfer. 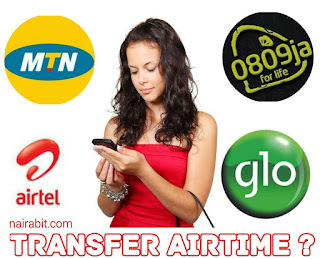 MTN calls it's airtime transfer service, Share 'n' Sell, Glo and Airtel, call it Me2U and Etisalat, Easy Airtime Transfer. Other recharge options include recharge cards, online or e- topup, ATM transfer, VTU.It is convenient, as you do not have to go and look for where to buy recharge card immediately . It is also flexible, as you are not constrained by the fixed denominations of recharge cards meaning you can transfer any specific amount you want such as N52, N71, N105 and so forth. It is safe and secure, as the transfer transaction is protected by PIN or password. MTN Share and Sell, is an airtime transfer service provided by MTN Nigeria. It allows prepaid customers to send credit from one prepaid MTN account to another MTN prepaid account via SMS or USSD code. and send it to 777. After the default PIN has been changed to a new PIN, you will receive a successful message. Within seconds, you should receive a message to confirm the transfer. Send the word, Yes to 777 to confirm the transfer. Airtel Me2U charges the cost of an off- peak SMS rate (N10 at the time of publication of this post) for each successful transfer. Note there are five zeros , your new pin should be 5 digits. You will recieve a notification asking you to confirm the PIN. To accept, press1, or press2 to cancel. This also applies to other networks. Airtime transfer services provided by all the networks can also be accessible via their Service Menu on your phonr. Remember to keep you PIN, secret. If you find this post useful then click on any of the SHARE/LIKE buttons below for the benefit of other people. Never miss any of my latest update from nairabit, download Nairabit android app now.